A hairstyle can either define and refine your look, or it may destroy a perfect look. So, it is important that you understand what hairstyle is suitable for your face cut and complete your perfect look with amazing styling guide that we have brought to you in this article. Understanding the geometry of your face will help you to relate the accentuated features of your face and you can dress your hair accordingly, as per the occasion and completely supporting your face structure. Let’s check out what kind of hairstyles are suitable for different type of face cuts, as per their shape and you can even use the celeb references for ideas to style your hair. You can inspiration from Alia Bhatt, Emma Stone, Shilpa Shetty or Aishwarya Rai for styling your hair, as they also have round shaped face cut. A well-defined pixie cut or layered bangs are the best options that you can opt for to accentuate your cheekbones and jawline better. Long and side-swept are also other options that you can go for. Avoid getting big round curls as they will only add volume to your cheekbones, making you look rounder. People with square shaped face have strong jawline and cheekbone, falling into almost the same width as the forehead, making your face square. 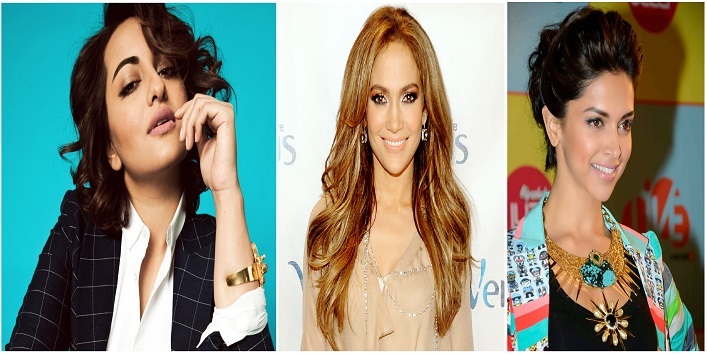 Make your style icon to Kareena Kapoor, Angelina Jolie, Megan Fox, or Preity Zinta, to get the best suitable hairstyles for any occasion you want. Long bob or soft waves while keeping the length long is a good idea to follow for the haircut, and middle parting will add length to your face. Avoid getting high ponytails or one-length bob or even blunt bangs. Also read: Here’s Why Jacqueline Fernandez is the Hairstyle Queen of Bollywood! People blessed with the oval shaped face cut can carry almost every hairstyle, effortlessly! Add layers to add and highlight jawline and cheekbones, or you can pull-off a pixie-cut easily. But if you love your long hair, then the beachy wave is the style for you. Celebs like Sonam Kapoor, Beyoncé and Taylor Swift are a few who fall into this category. It is best that you avoid fringes or bangs as they will only add volume than your existing broad forehead. The special feature of the heart-shaped face is that they have a beautiful pointy chin, which makes that stand out from the crowd. Deepika Padukone, Sonakshi Sinha, Jennifer Lawrence, Priyanka Chopra, Jennifer Aniston and Katharine McPhee, are few of the celebs that fall under this category. To get more of an angular look, you can opt for side swept, that will make your face look balanced, or you can go for curly waves right below the chin to add width. Avoid doing heavy hairdos at the crown of your head, that will only add more width to your face from upper side, and also blunt fringes. People with such shape of the feature, must opt for hairstyles that add width to the side of their face. The best way to balance your look is to play around with fringes or bangs, but shoulder-length haircuts are the best for you. The celebs that fall under this category are Katrina Kaif, Kim Kardashian, and Anushka Sharma. Round bangs or chin-length cuts might work great for you. Avoid center parting or too long plain straight hair, this will only add more length to your face.